Need to access your passwords, secret questions, and personal ID information anywhere, anytime? Then you need to take a look at the new RoboForm online service. I recommend it. Sync your passwords, secret questions, and other identity information with RoboForm servers. All data shared with RoboForm is encrypted with AES using a password which only the user knows. RoboForm cannot access your data. Access your online information from any computer with Internet access, without installing any software. Access your online information using selected smartphones, including iPhones and Blackberries. Before we get to the online capabilities, let’s walk through the RoboForm Pro client application functionality. 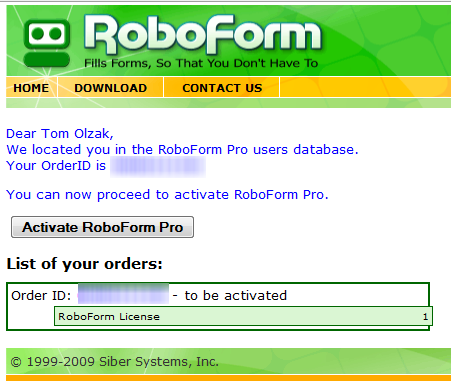 The RoboForm Pro client, with a $29.95 price tag for the first license, is available for download. There is a nice quantity-discount calculator at the site, but $15.95 seems to be as low as it goes. I downloaded the client and installed it on my desktop (Windows 7 and Firefox 3.5). After activation (see Figure 1), I restarted Firefox. The toolbar shown in Figure 2 appeared. The time-to-live setting for the RoboForm master password is an important setting during setup. As you’ll see as we step through this section, maintaining an active login to the client provides access to passwords and other private information. So you want the login to expire without having to think about it. The default is 120 minutes. I set mine to 10. The core of RoboForm password management is the passcard. A passcard contains login and address information for a specific site or application. There are two ways to set one up. First, you can navigate to the login screen of the target site or Web application and enter your account ID and password. You can also pre-configure a site login. 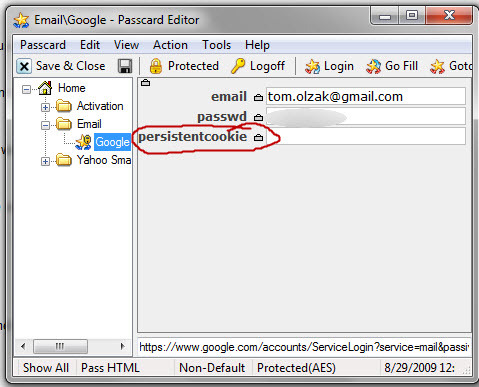 To create my Gmail passcard, I provided a name and left Password-protect checked, as shown in Figure 3. This requires the encryption password before I can access it. I then created an email folder in which to place the passcard. I also checked Add Shortcut to Links Toolbar. When I clicked save, a button with the passcard name appeared in the RoboForm toolbar (See Figure 4). Also saved was the URL to the login page. In addition to passwords, you can store all personal information–including credit cards, bank account info, and social security number–in an identity form. See Figure 6. Note that the identity information, like all passcards, is encrypted with AES. 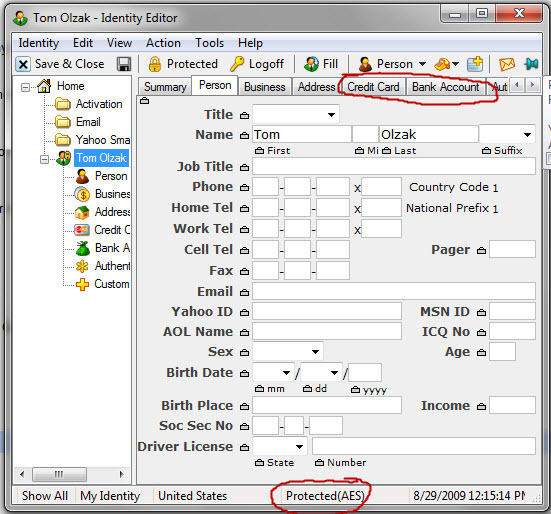 When saved, the identity appears in the RoboForm toolbar, as shown in Figure 4. You can use it to fill-in any browser-based forms, and you can create multiple identities. Finally, you can create free-form safe notes. I created one to hold a sample security question, as shown in Figure 7. This is a good time to talk about encryption strength. The strength of the AES encryption used depends on the password used to protect your RoboForm information. If you can’t decide on a password for an account, the create-a-password feature built-in to RoboForm can help. There was a small issue with the sample password shown in Figure 7. It contained a dictionary word. While this might not be a huge problem, you should be aware this might happen. Play with this a little. You can watch the bit strength change as you change the provided parameters. So far, this looks like something I can use. However, what happens when I’m not in front of the computer with my client software installed? Well, I can create a repository with software loaded on a thumb drive. Or I can use the new RoboForm online service (beta). The online service provides you with your passwords, identity information, and safenote data anytime, anywhere. The data is encrypted with your master password, which only you know. If you lose the password, you lose your data. Not even RoboForm can help. To synchronize your local information with the online service, you first have to create an online account. RoboForm must be installed on your computer to use this service. Once the account is created, and you have synchronized your computer with your online repository, you can access your RoboForm data using an SSL connection as shown in Figure 8. To sync your computer, click the Sync button in the toolbar. If this is your first sync, RoboForm needs your online user ID and password, as shown in Figure 9. Sync settings can be set or changed at any time by using the button shown in Figure 10. Once configured, the prompt shown in Figure 10 is displayed, allowing you to manually sync your data and select auto-sync if you don’t want to worry about pushing future changes or additions to the online repository. Note that you can also sync to local or network storage devices. There are differences between using the online service and the local client. The online service is free to try while in beta. No future cost information is currently available. The last online feature I tested was access via smartphone. This worked flawlessly when I tried using my iPhone 3GS. Figures 11 and 12 show the screens provided. I recommend both the client software and the online solution. This is the best password, identity, and general sensitive information repository solution I’ve seen. If you are worried about how RoboForm manages passwords in memory, check out the user manual. Passwords are purged from memory during events you select. Keeping all your sensitive information in a centralized location helps with security. However, SMBs with large storage needs (or home users with way too much audio-video gear) may find the new D-Link SAN array useful. It’s everything a SMB needs to consolidate, protect, and ensure available of sensitive information.